Friday night’s Vegas Strong Benefit Concert at T-Mobile Arena united the Las Vegas entertainment industry and close-knit community for an evening of live performances and heartfelt video tributes honoring victims and survivors of the October 1 tragedy. More than a dozen A-list entertainers and homegrown talent convened to benefit the Las Vegas Victims Fund in front of a capacity crowd of 12,000.. 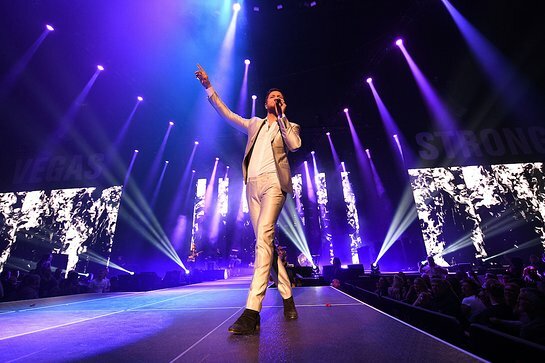 The full lineup included Imagine Dragons, The Killers, Boyz II Men, Jay Leno, David Copperfield, Penn & Teller, Carrot Top, Cirque du Soleil and Blue Man Group; appearances by Bryce Harper, Kurt Busch, Wayne Newton; and tribute videos from Jason Aldean, Celine Dion, Elton John, George Strait and the Las Vegas Golden Knights. The evening commenced as Carrot Top welcomed an arena of thousands of supporters. He introduced messages from Vegas Golden Knights players who shared their pride for being part of the Las Vegas community. The program continued with Las Vegas native and Washington Nationals 2015 National League MVP Bryce Harper, who thanked the first responders as well as the Las Vegas Metropolitan Police Department and hospital staff. Jay Leno followed on stage and had the crowd laughing hysterically with a series of jokes in his signature style. Route 91 Festival headliner Jason Aldean next shared a special video tribute, delivering good wishes and messages of positivity with the audience. The memorable moments continued as Blue Man Group put on a tubular performance, entertaining the audience with its silent wit and rhythmic talent. Artists from Cirque du Soleil’s Mystère followed with unparalleled energy, mesmerizing the crowd with a performance of acrobatic strength and precision timing. Las Vegas illusionists Penn & Teller integrated the crowd into the show, allowing each audience member perform their own card-based magic trick. The elated cheer of surprise rippled through the arena as everyone applauded the charismatic duo. The cheerful conclusion brought all performers to the stage for a chorus of the late, great Elvis Presley’s “Viva Las Vegas,” with Dan Reynolds and Brandon Flowers exchanging lead vocals. The crowd swelled with emotion and pride for the Las Vegas community that has proven unbreakable.